Five years ago this March, when “Your Town and My Town” first started as a weekly feature of “The Suburban”, the Wayne Estate houses were among the earliest topics taken up by your columnist. From time to time additional information has been given on this subject, always a popular one among our readers. Newcomers are always surprised at the repetition of architectural design in Wayne and St. Davids. In answer to their questions they hear the story of George W. Childs, the Philadelphia financier who transformed Wayne from a small hamlet into a prosperous suburb. In fact, Mr. Childs is often referred to as “the founder of the town of Wayne”. When prospective buyers of homes came out to Wayne, they found they could select the lot on which they wanted to build and use either their own plans or those of Wendell and Smith, Mr. Childs’ “Home Builders”. Or they could purchase on the spot “a complete house, ready for occupancy, with graded and fenced lot, the crushed stone walks made and seed sown for the lawn”. Also, a vacant lot had been left between each house to be sold on easy terms, should more ground be needed. Terms of sale were a down payment of $2,000 in cash, or “other terms could be arranged if desired”. While plans could be made to build any kind of house, the prospectus set forth the financial advantage of “wholesale building”. 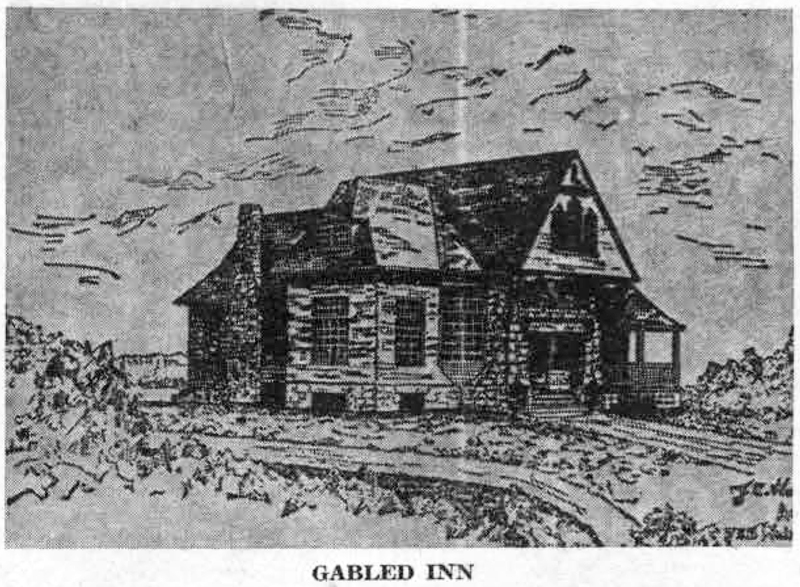 Choice of plans included the “Gabled Inn”, the “Flemish House”, the “Round End House”, the “NewTower House”, the “Pillar House” and a number of others without specific names like these. For those who liked the location of houses of these types already built, immediate purchase and occupancy were possible. Although this type of house stood on the same size lot as the Gabled Inn, it was far more pretentious and sold for $7,000. 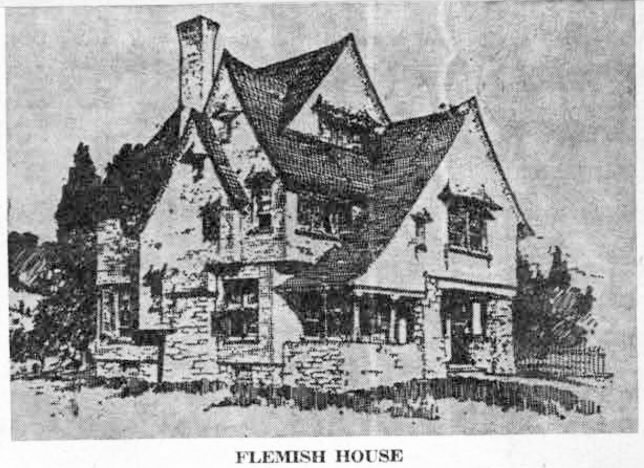 Most of the Flemish Houses were originally built on Chestnut lane, Woodland avenue and Beechtree lane. Such a house is described as having “a parlor, living room, open hall and oak stairs… dining room, pantry, kitchen and out-kitchen on first floor… seven chambers, bathroom and store room, liberal closet room”. By way of additional attraction there were “handsome effects in colored glass and open grates with unique mantels”. 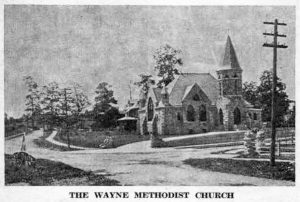 In the year 1892, when these pictures were taken to illustrate a handsome brochure, issued for advertising purposes by the Wayne Estate, four religious denominations had churches in Wayne. 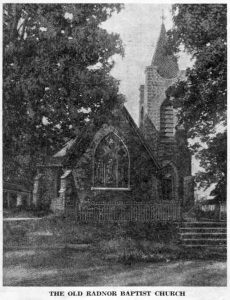 The Baptists had had a meeting house on the corner of Conestoga and West Wayne avenues since 1841; the Presbyterians had completed their original chapel in 1870; St. Mary’s Episcopal Church was finished in 1889, while the Wayne Methodist Church was dedicated in June, 1891. 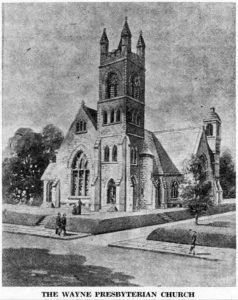 By 1890 one of these congregations, the First Baptist, had erected a second building, on the site of the first small structure and, by 1892, the Wayne Presbyterians had completed their first church edifice, to the west of the chapel. In the five years between 1887 and 1892, Wayne’s population had been multiplied more than eight times, from an approximate 300 to about 2,500. Larger church buildings were required to meet the religious needs of a fast growing community. Now, more than 60 years later, three of these churches still look much as they did in 1892. The fourth one, the First Baptist, was torn down two years ago, and has its successor in the Central Baptist Church. It is interesting to observe that two of these churches have recently met the demands of still fast growing congregations by the purchase of properties adjoining the churches. The Wayne Presbyterian is rapidly turning the former Wayne Hotel into a Church House, while the Wayne Methodist has recently purchased the former Herbert L. Badger property for the same purpose. Meanwhile the Central Baptist is making plans for further expansion. Although structurally the same in 1954 as in 1892, the Wayne Methodist Church has a different appearance now, owing to the growth of trees, foliage and vines. The former Badger home, which is soon to be turned into a church house, shows just to the left in this picture. The lot to the right of the church, which was empty in 1892, is now occupied by the parsonage, which was erected in 1909. In the right foreground of the picture are the two stone posts at the entrance to the R.P. Elmer house. The attractive bit of rustic fencing evidently marked the course of a rapidly flowing underground stream. The Wayne Estate brochure describes the church as “beautifully situated at the corner of Audubon and Runnymede avenues… the dates of the principal events of its history may serve as illustrating the growth of Wayne itself… the corner stone was laid in September, 1890, and the edifice was dedicated June 28, 1891. On the first anniversary of the dedication, the new and beautiful pipe organ was dedicated. Like the Methodist Church, the Wayne Presbyterian Church had a rather stark appearance in 1892. The original church structure also seems much smaller since the Sunday School addition, on the rear at the eastern side, was not made until some years later. Frederick F. Hallowell house at 220 Walnut Ave. in the “Pillar House design,” Wendell & Smith, North Wayne Protective Association, Wayne Title & Trust Co. In the 1880’s when Wendell and Treat first started to build the Wayne Estate houses, they chose North Wayne for their earliest sites. Of the streets comprising this section, North Wayne avenue and Walnut avenue were among the first to be closely built up. The illustrations for today’s column, which show two of these Walnut avenue houses, built in the middle eighties, are from the album of pictures belonging to George W. Schultz, from which a number of our other recent illustrations have been made. They are particularly interesting in that members of the original families occupying both houses are shown in these pictures. The Frederick F. Hallowell House on Walnut avenue. 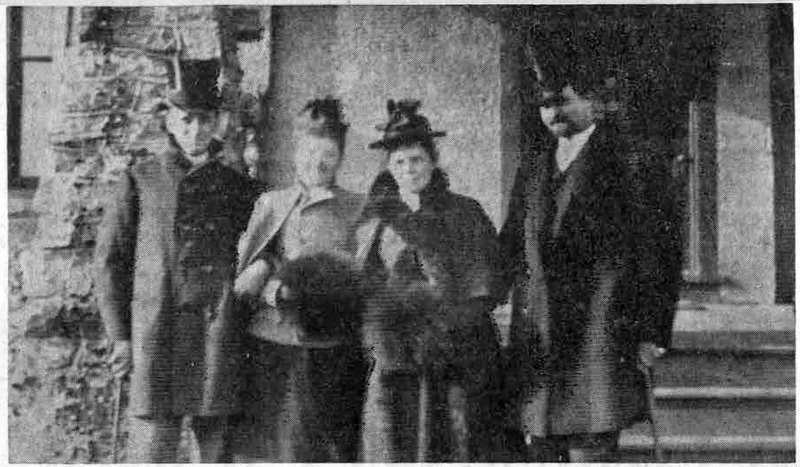 Top row: Mrs. Margaret Furman, Miss Field and John Hunter. 2nd row: Mrs. Hallowell, Mr. Hallowell and Norman Hunter. 3rd row: Will Hunter. The houses, looking very much as they did when originally built, are still very easily recognized. The first one, 220 Walnut avenue, is now occupied by the C.W. Getty family, and the second, at 215 Walnut avenue, is now the home of Miss Mary DeHaven Bright. In 1887 Mr. and Mrs. Frederick Fraley Hallowell and their family moved from Philadelphia to Wayne, to occupy their Walnut avenue Estate. Mrs. William A. Johnson, the former Miss Rita Hallowell, tells your columnist that when her mother selected this so-called “Pillar House”, from various ones shown her in the architect’s drawings, Mr. Wendell of the Wayne Estate tried to dissuade her from her choice. For one thing the cost was high, he said, and for another it was of a type that not many people would like! Interestingly enough it was this very same type of house that Mr. Wendell himself selected for his own home on the large lot facing Radnor road, bounded on one side by Beechtree lane and on the other by Walnut avenue. The “Pillar House”, which proved to be one of the most popular of those offered by the Wayne Estate, is described in one of the booklets as “built with stone and brick, pebble coated to second story; large porch, vestibule, open hall, reception room, library with open grate and mantel, dining room, kitchen, out-kitchen, with stationary soapstone washing tubs.” There were five bedrooms and a bath on the second floor and two on the third. Further description states that “a novel effect has been produced by joining the back and the main stairways and putting a glass window over both. This is quite a feature of this plan.” These “Pillar Houses”, for which F.L. and W.L. Price, of Philadelphia, were the architects, stood on large lots and sold for $8,250. Mr. and Mrs. Hallowell identified themselves with the community life of Wayne as soon as they settled in their new home. One of Mrs. Johnson’s earliest recollections is of seeing her father and mother in skating costumes on the old Kelly’s Dam. She also remembers the nine hole golf course where Poplar avenue now is, particularly interesting to small fry, since they were allowed to play there. Mr. Hallowell was one of the earliest members of the North Wayne Protective Association, manifesting his active interest by going out to all fires and “manning the pump”, which was kept in the Wood stable next door. He was also a cricketer in the old Merryvale Club and later refereed all the High School football games. He served for years on the Radnor Township School Board and was also one of the County Commissioners. When the Wayne Title and Trust Company was founded he was its first treasurer, later becoming associated with the Western Savings Fund Society in Philadelphia. The Walnut avenue house remained in the possession of the Hallowell family until the late ’30’s, when it was bought by Mr. and Mrs. C.W. Getty, its present occupants. In contrast to the Hallowell family, the Powel family lived on Walnut avenue but a few short years. 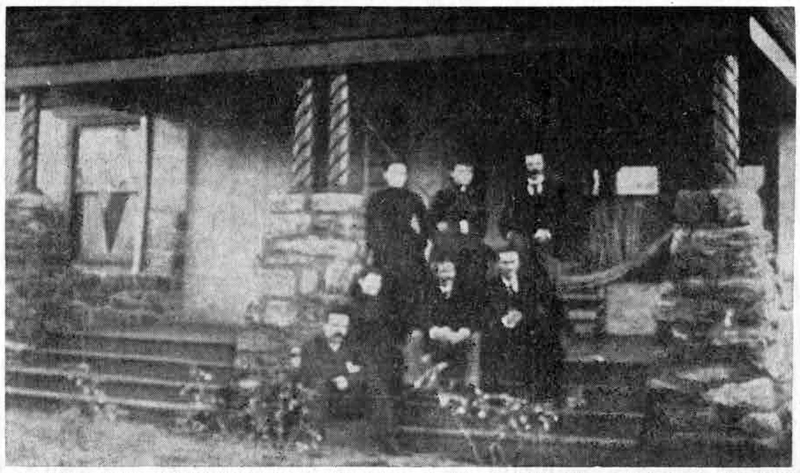 The two young men shown in the picture were sons of John Hare Powel, of Philadelphia, millionaire iron master and owner of furnaces, mines and coke ovens throughout Pennsylvania. The Henry Powels lived at 215 Walnut avenue, just east of the Schultz home. Later Mr. and Mrs. Robert Hare Powel came to South Wayne to live. The Miss Smith, of Quebec, who is shown in the picture, was the sister of Mrs. John Hare Powel, whom she was visiting at the time. DeVough Powel lived in New York City and was a guest of the Henry Powels when the picture was taken. As was stated in an earlier column of this series, the original Powel home, then on South Third street, Philadelphia, dated back to 1768. It was of such beauty and historic interest that the furnishings of its drawing room have been moved into the Philadelphia Museum of Art. A recent brochure received by your columnist from the Museum shows a picture of this beautiful room as it is exhibited in the Museum. The three pictures illustrating this week’s column show landmarks of an earlier Wayne. The second and third pictures are of buildings that live only in the memories of some of the really old “old timers” of this section. The first picture, although it may be recognized by few, is of a building that has been destroyed so recently that some of its foundations are still standing amid its scattered timbers. This picture was taken in 1870, “when residents swished through a cornfield to catch the 8:15 train to Philadelphia.” The smaller building to the right was the waiting room of the Pennsylvania Railroad’s station at Wayne. The larger building to which it was attached housed the family of the station agent. Railroad tickets were also sold there and it is said that J. Henry Askin, one of the founders of Wayne in the 1870’s, had a private waiting room in this house for his family and himself. At that time the railroad tracks ran to the south of the present roadbed, thus placing the station to the rear of the Wayne Presbyterian Chapel. 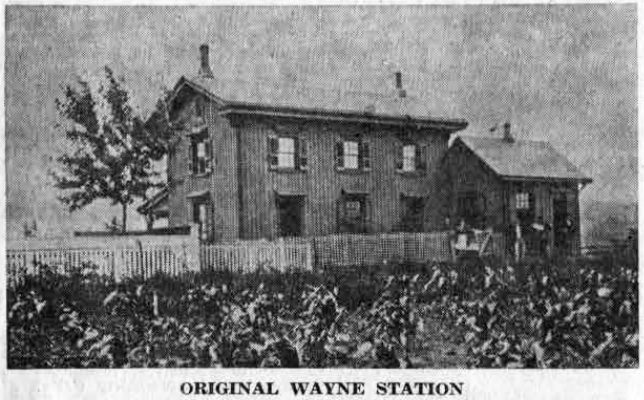 The picture was taken from the one-time cornfield that is now a part of the Wayne Hotel property, recently bought by the Wayne Presbyterian Church. The small waiting room building was later transported to Strafford, where it stood until the present building was erected there. After the tracks were moved slightly to the north, the cottage still remained on its original site, later becoming the property of the original station building. Until 1900 this neat white house with its dark shutters and its picket fence stood on the west side of North Wayne avenue on what is now Charles LeBoutillier property. 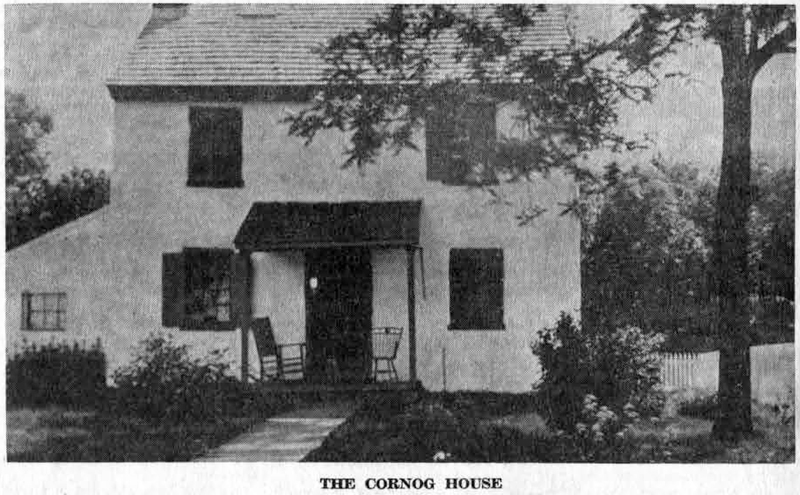 It was known for many years as the “Cornog House”, since it was built and first occupied by members of that pioneer family of Radnor township. This picture was also taken by Mr. Schultz in the 1880’s. 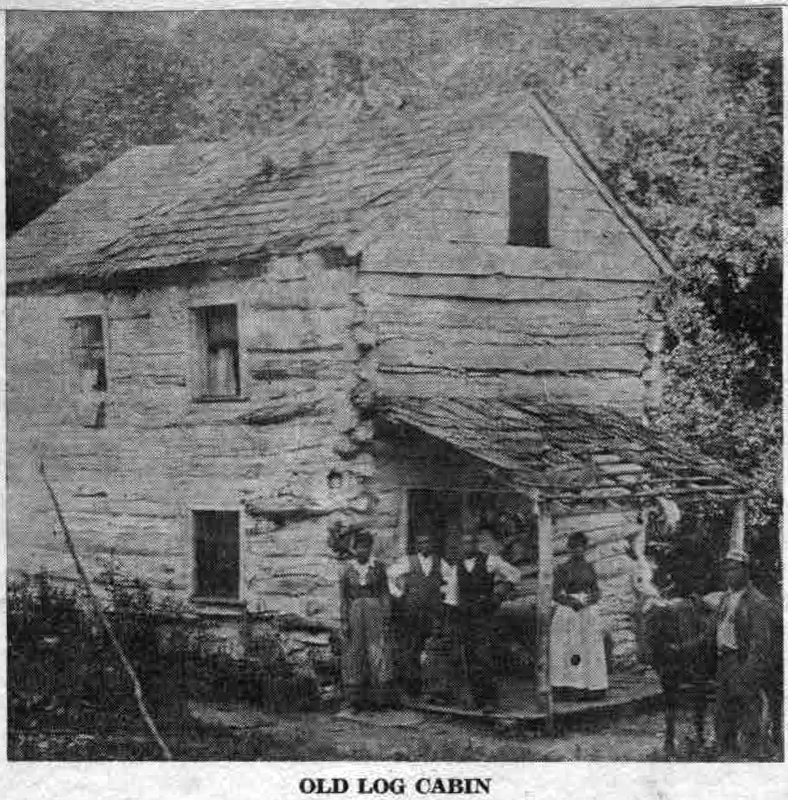 The picture of this small cabin made of hand-hewn logs is perhaps the most picturesque one yet used in this series of articles. Even in its day and time it must have been unique in this section. So far as can be ascertained it stood back of the First Baptist Church, between Conestoga road and the present Highland avenue, and very close to Johnson’s quarries. The group of five, with a horse belonging to one was evidently especially posed for the picture when it was taken in the 1880’s. There is something very appealing in the figure of the woman at the right with her hands folded over her ample white apron.